Update coming tomorrow. Sorry it's so late. Last week was Thanksgiving and my birthday. Aoshi and Marko charge the skeletons. Patrick and Elos take up a defensive position. Elos lets an arrow loose. It hits a skeleton in the shoulder, disconnecting its arm from its body. The skeleton still walks toward the heroes. 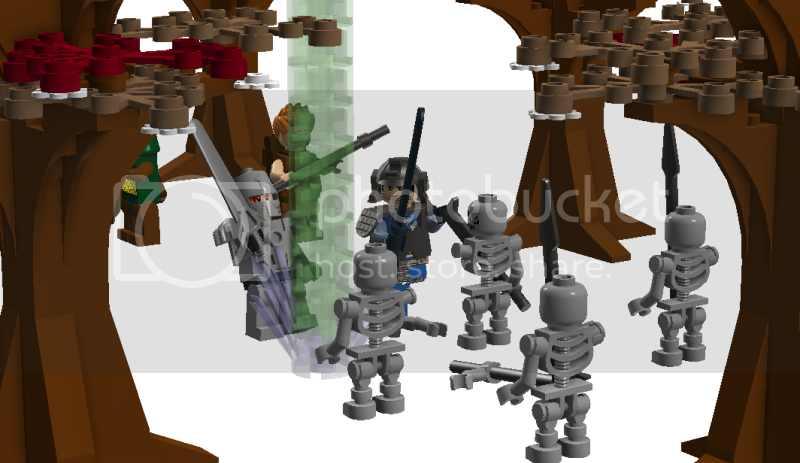 Aoshi and Marko attack the skeletons closest to them. Aoshi slices an arm off, but the skeleton still moves and wields a sword in his other hand. Marko crushes his target's skull. It erupts into a pyre of dark energy! Marko has discovered how to slay the skeletons, but it has come at a price. The dark energy has cut Marko, and some of his blood has been spilled. "Get away from Marko, now!" says Elos as he cautiously moves backwards. "I can't hold it back!" >Wolf mode, go into a frenzy. Back off, be ready to knock out Marko if need be. He morphs into his wolf form and begins running towards a skeleton. lands on the skeleton closest to him and begins to rip it apart! Two skeletons turn their attention toward him. Marko pauses for a moment. Then he hurls a skull at the skeleton holding the spear and turns quickly to face the other. The skull collides with the other skeleton and they are destroyed. Marko rips the sword arm off his target and begins to shake him violently. He slams the skeleton down and it is destroyed. He lets out a blood curdling howl while the other skeleton gets into position. Everyone else in the group stares at Marko's raw power. Aoshi prepares to knock him out in case he can't be controlled. Marko feels hungry. He has not eaten raw meat in months. Marko is a knight, sworn to uphold the values of chivalry. He takes his eyes off his comrades and leaps onto that last skeleton. I have to admit that this forum is really cool, and the LDD is also what makes it. Good Luck with the story, I sure hope this doesn't get discontinued. 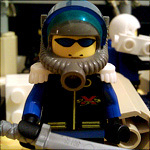 redBeardDwarf wrote: I have to admit that this forum is really cool, and the LDD is also what makes it. Thanks man! You're welcome to join in anytime. Send me a PM with your character details and I'll work you into the story. My orders are the same until Marko calms down or something new happens. I will also prepare to bring Marko down if absolutely need be. Or light a fire in my hand. Wolves don't like fire I think. But I will wait to see if he calm down first. Hey guys, sorry for the delay again. I'm in the middle of moving. I'll post results ASAP. Gentlemen, the holidays are over, but alas, I can not provide you with more Sky Ruler just yets as my computer is down again due to a virus. This is the last time I ever try to download Rise of Nations from Pirate Bay. Someone else may take over as game master for a while provided they consult with me before posting any actions. Any takers? It will be an unpaid temporary position. Needing a distraction from the temptation of eating his comrades, Marko rushes the last skeleton. However, he is struck with the skeleton's spear and receives critical damage. Before the skeleton can deal a finishing blow, Aoishi is quick to counter attack. Using both his and Marko's swords, he is able to deal a punishing hit. The last enemy explodes in a burst of magical energy. Marko quickly regains his strength, with no enemies left to distract him, the smell of his comrades triggers his heightened smell. "Marko," says Elos calmly as he fits an arrow onto his bow string. "Don't make us do something we'll regret. Aoishi stares back into the frenzied eyes of the werewolf. Patrick's hands begin to heat up.